This dish is inspired by a delicious appetizer and salad I learned how to make at my summer job at The Edible Story. It is a gorgeous appetizer and cheeky way to serve your salad at your next barbecue. The classic trio of endive, bacon and blue cheese work harmoniously in this bite-size delight. On a sheet pan lined with parchment, add the pancetta, and place in the oven for 10 minutes, or until it is crispy. Place the eggs in a pot and cover with 2 inches of water. Bring the water to a boil, then remove from heat and leave covered for 10 minutes. Run the eggs under cold water and carefully peel and cut into a fine dice. 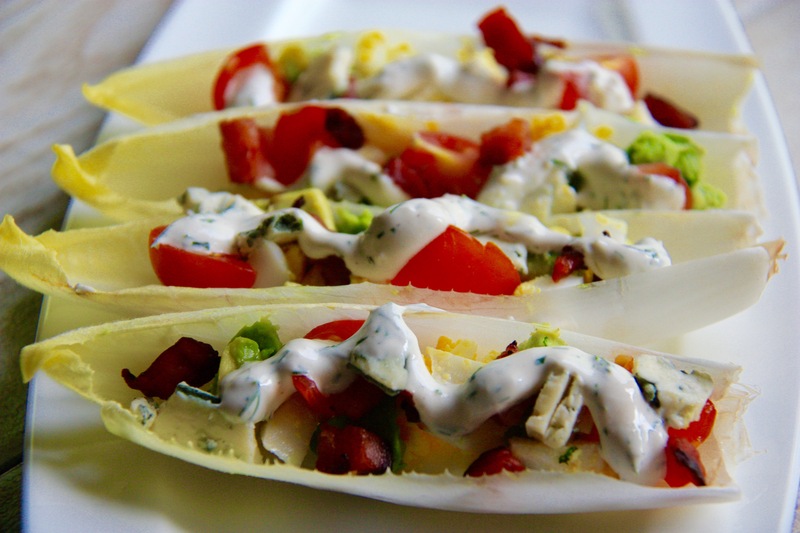 Amongst the peeled endive leaves, divide the eggs, bacon, tomato, avocado, and blue cheese. For the dressing, combine all of the ingredients. Drizzle the dressing over the salad spears. Serve and enjoy! Spears are the perfect way to serve your favourite salads in bite-size! Next time try a Caesar or Greek Salad to mix it up.